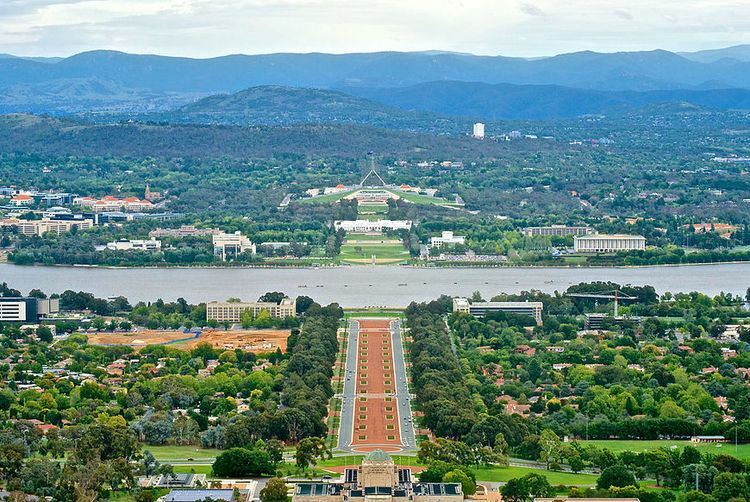 Canberra ( or ) is the capital city of Australia. With a population of 403,468, it is Australia's largest inland city and the eighth-largest city overall. The city is located at the northern end of the Australian Capital Territory (ACT), 280 km (170 mi) south-west of Sydney, and 660 km (410 mi) north-east of Melbourne. A resident of Canberra is known as a "Canberran". Although Canberra is the capital and seat of government, many federal government ministries have secondary seats in state capital cities, as do the Governor-General and the Prime Minister. R. H. Cambage in his 1919 book Notes on the Native Flora of New South Wales, Part X, the Federal Capital Territory noted that Joshua John Moore, the first settler in the region, named the area Canberry in 1823 stating that "there seems no doubt that the original was a native name, but its meaning is unknown."' Survey plans of the district dated 1837 refer to the area as the Canberry Plain. In 1920, some of the older residents of the district claimed that the name was derived from the Australian Cranberry which grew abundantly in the area, noting that the local name for the plant was canberry. Although popularly pronounced or , the original pronunciation at its official naming in 1913 was . Under Köppen-Geiger classification, Canberra has an oceanic climate (Cfb). In January, the warmest month, the average high is approximately 28 °C (82 °F); however, in July, the coldest month, the average high drops to approximately 11 °C (52 °F). Frost is common in the winter months. Snow is rare in the CBD (central business district), but the surrounding areas get annual snowfall through winter and often the snow-capped mountains can be seen from the CBD—the last significant snowfall in the city centre was in 1968. The highest recorded maximum temperature is variously reported as 42.2 °C (108.0 °F) on 1 February 1968, or as 42.8 °C (109.0 °F) at Acton on 11 January 1939. Winter 2011 was Canberra's warmest winter on record, approximately 2 °C (4 °F) above the average temperature. Outside Canberra, the Australian Capital Territory has no settlements larger than a village. The Australian Capital Territory Legislative Assembly performs the roles of both a city council and territory government. The assembly consists of 25 members, elected from five districts using proportional representation. The five districts are Brindabella, Ginninderra, Kurrajong, Murrumbidgee and Yerrabi, which each elect five members. The Chief Minister is elected by the Members of the Legislative Assembly (MLA) and selects colleagues to serve as ministers alongside him or her in the Executive, known informally as the cabinet. Whereas the ACT has federally been dominated by Labor, the Liberals have been able to gain some footing in the ACT Legislative Assembly, and were in government for just over eight of the Assembly's 25-year history, mostly during a period of six and half years from 1995 and 2001, when Labor won power. At the 2004 election the Australian Labor Party, headed by then Chief Minister Jon Stanhope, won nine of the 17 seats and formed the ACT's first majority government, but after the 2008 election was forced into minority government with the support of the Greens. Since the 2012 elections, the ACT has been governed by a coalition of Labor and the Greens. People who have been charged with offences are tried either in the ACT Magistrates Court or for more severe offences, the ACT Supreme Court. Prior to its closure in 2009, prisoners were held in remand at the Belconnen Remand Centre in the ACT but usually gaoled in New South Wales. The Alexander Maconochie Centre was officially opened on 11 September 2008 by then Chief Minister Jon Stanhope. The total cost for construction was $130 million. Courts such as a Small Claims Tribunal and a Family Court exist for civil law actions and other non-criminal legal matters. Expansion AFL club Greater Western Sydney Giants commenced a partnership with Canberra in 2012 will play three home games at Manuka Oval each season until at least 2021. Prior to this the Melbourne-based AFL team the Kangaroos played some home games at Manuka Oval until July 2006. Following the move of the Kangaroos' alternative home ground to Carrara in Queensland, Melbourne and the Western Bulldogs played some home games at Manuka Oval from 2007 against the Sydney Swans. Canberra is also home to the Barassi International Australian Football Youth Tournament. The historic Prime Minister's XI cricket match is played at Manuka Oval annually. Other significant annual sporting events include the Canberra Marathon and the City of Canberra Half Ironman Triathlon. Canberra has numerous sporting ovals, golf courses, skate parks, and swimming pools that are open to the public. Tennis courts include those at the National Sports Club, Lyneham, former home of the Canberra Women's Tennis Classic. A Canberra-wide series of bicycle paths are available to cyclists for recreational and sporting purposes. Canberra Nature Parks have a large range of walking paths, horse and mountain bike trails. Water sports like sailing, rowing, dragon boating and water skiing are held on Canberra's lakes. The Rally of Canberra is an annual motor sport event and a facility for drag racing is currently being planned for construction. From 2000 to 2002, Canberra hosted the Canberra 400 event for V8 Supercars on the temporary Canberra Street Circuit, which was located inside the Parliamentary Triangle. ACTION, the government-operated bus service, provides public transport throughout the city. Qcity Transit provides bus services between Canberra and nearby areas of New South Wales through their Transborder Express brand (Murrumbateman and Yass) and as Qcity Transit (Queanbeyan). A light rail line is under construction. It will link the CBD with the northern district of Gungahlin. In the 2011 census, 6.7% of the journeys to work involved public transport; with 6.5% walking or cycling to work. Electricity for Canberra mainly comes from the national power grid through substations at Holt and Fyshwick (via Queanbeyan). Power was first supplied from a thermal plant built in 1913, near the Molonglo River, but this was finally closed in 1957. A 20 megawatt photovoltaic solar plant, described as the largest photovoltaic solar farm in Australia, was officially opened at Royalla on 3 September 2014. The 2.3 megawatt Mount Majura solar farm was opened in Majura on 6 October 2016. Construction is under way on a 13 megawatt solar farm at Mugga Lane, Hume and an 11 megawatt solar farm at Williamsdale. The Williamsdale solar farm was originally planned to be built at Uriarra but faced local opposition. In addition numerous houses in Canberra have photovoltaic panels and/or solar hot water systems. Some limited local renewable power is produced via a hydro generator on the main water supply pipeline for Canberra at Mount Stromlo and methane plants at waste landfill sites at Belconnen and Mugga Lane. There are currently no wind-power generators in Canberra, but several have been built or are being built or planned in nearby New South Wales, such as the 140.7 megawatt Capital Wind Farm. The ACT government announced in 2013 that it was raising the target for electricity consumed in the ACT to be supplied from renewable sources to 90% by 2020. This will raise the target from 210 to 550 megawatts. It announced in February 2015 that three wind farms in Victoria and South Australia would supply 200 megawatts of capacity; these are expected to be operational by 2017. Contracts for the purchase of an additional 200 megawatts of power per year from two wind farms in South Australia and New South Wales were announced in December 2015 and March 2016. The ACT government announced in 2014 that up to 23 megawatts of feed-in-tariff entitlements would be made available for the establishment of a facility in the ACT or surrounding region for burning household and business waste to produce electricity by 2020.